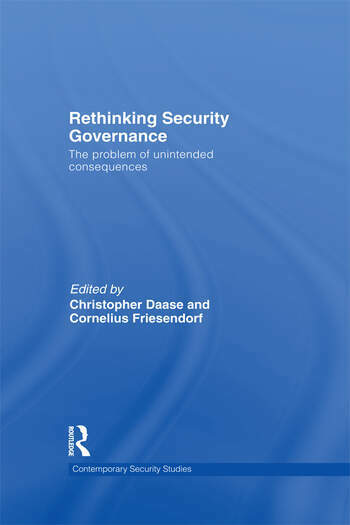 This book explores the unintended consequences of security governance actions and explores how their effects can be limited. Security governance describes new modes of security policy that differ from traditional approaches to national and international security. While traditional security policy used to be the exclusive domain of states and aimed at military defense, security governance is performed by multiple actors and is intended to create a global environment of security for states, social groups, and individuals. By pooling the strength and expertise of states, international organizations, and private actors, security governance is seen to provide more effective and efficient means to cope with today’s security risks. Generally, security governance is assumed to be a good thing, and the most appropriate way of coping with contemporary security problems. This assumption has led scholars to neglect an important phenomenon: unintended consequences. While unintended consequences do not need to be negative, often they are. The CIA term "blowback," for example, refers to the phenomenon that a long nurtured group may turn against its sponsor. The rise of al Qaeda, which had benefited from US Cold War policies, is only one example. Raising awareness about unwanted and even paradoxical policy outcomes and suggesting ways of avoiding damage or limiting their scale, this book will be of much interest to students of security governance, risk management, international security and IR. Christopher Daase is Professor at the Goethe University Frankfurt and head of the research department International Organizations and International Law at the Peace Research Institute Frankfurt (PRIF/HSFK). Cornelius Friesendorf is lecturer at the Goethe University Frankfurt and research fellow at the Peace Research Institute Frankfurt (PRIF/HSFK).